We’d love your help. 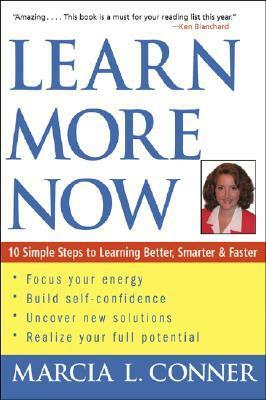 Let us know what’s wrong with this preview of Learn More Now by Marcia Conner. To ask other readers questions about Learn More Now, please sign up. Recommends it for: Everyone-this can help each person learn beter, faster, smarter. This has been a very interesting book to read. It covers so many aspects of learning and how each person processes learning differently. I would recommend this book to anyone who learns, teaches and interacts with other people in this capacity... so, essentially, everyone. It has helped me become a better student in school and at church. It helped me to understand why I am impatient at times while I am being taught something new and how to move past that so that I can be more receptive to what I This has been a very interesting book to read. It covers so many aspects of learning and how each person processes learning differently. I would recommend this book to anyone who learns, teaches and interacts with other people in this capacity... so, essentially, everyone. It has helped me become a better student in school and at church. It helped me to understand why I am impatient at times while I am being taught something new and how to move past that so that I can be more receptive to what I am being taught. This book has helped me as a mother understand why my children listen, understand and learn the way they do which has created greater patience in me as I raise them. It has explained fundamental differences in how both myself and my husband process information, disintegrating the frustration we've had at times while trying to work together. I was tasked to read this book while taking COL 100 with AMU. I was very fond of the fact that it required you to look within yourself. More importantly, be honest with yourself. The cover does not lie, if you were to give this book the time of day, it will make you a better learner because you will understand how you learn as individual. In the end making you more self-aware of what you need to do to be more effective. Read for a college course through AMU. Pretty good book, easy to read, and uses good logic. The book covers every aspect of the learning process: from the physical learning environment such as lighting, noise level, temperature, etc., to the analysis of the different types of learners to include motivation styles, learning styles, attention styles, direction styles and togetherness styles. I had to read this for a COL100 course my first year, and couldn't have been more bored with such doleful topics of fanaticism and pseudo-psychology. "Focus your energy"...? What does that even mean in a pragmatic, realistic, sense? Nay, if one wants to learn more, they must pay themselves due diligence in careful study, meticulous review, and time-consuming memorization. There is no 'easy' way to become a scholar, regardless of how 'focused' your energy is. I had to read this book because it was required for one of my college courses. The book is great for those looking for helpful tips for making learning become more fun and easier. Participate in the exercises in the book and write notes throughout. This book helped to prepare me for on-line education. It was issued for my COLL100 class. I would reccomend this to anyone getting ready to start on-line education as it gave me an insight into my learning style that really helped me to come to terms with how I would handle distance learning. I read this book for school. It had some interesting quizzes, and exercises to help you figure out how you learn best and what to do about it. It's not something I would have ever picked up on my own to read. It was interesting, but I'm not so sure I would ever recommend it to anyone. This was assigned reading for one of my college classes. I found it very insightful as to how I learn and it actually motivated me to do better. I recommend this book to everyone who would like to be a more effective learner. Read it for a class. Worthwhile. Was a great first book to read in college! This book had excellent tips and tools for increasing memory retention and improving study skills. I liked it so much I want to implement some of the ideas into my children's study habits. Boring and all stuff I have heard before. This was a textbook in a class I took. Research isn't bad and it contains a few ideas that are decent but nothing new or innovative really. This book was helpful in creating better study habits, but a lot of it was what I already knew I needed to change. Either way, it was a good read. I already knew how I learn when I read this, but it has helped me become a better trainer and teacher. I recommend it to anyone who needs to teach anyone anything. After decades working within organizations pointing out the emperor has no clothes, I realize no one wants an emperor. It's time to focus my skills and experience making large-scale change to catalyze a societal shift. The social revolution isn't only needed in distant lands. It's needed under our feet, wherever we stand. My books and my work with people across the globe focuses on the change in o After decades working within organizations pointing out the emperor has no clothes, I realize no one wants an emperor. It's time to focus my skills and experience making large-scale change to catalyze a societal shift. The social revolution isn't only needed in distant lands. It's needed under our feet, wherever we stand. My books and my work with people across the globe focuses on the change in our midst and the chance we have to make a difference. Called by some a "blank page systems architect," serving as senior counsel to executives, corporations, politicians, governments, non-governmental organizations, and schools, I work with big-vision leaders, impact entrepreneurs, and unreasonable thinkers, ready to use their superpowers for good. A few years ago I published a 2nd edition (fully updated) to The New Social Learning: Connect, Collaborate, Work (ATD, June 2015), authored Learn More Now (John Wiley & Sons, 2004), co-authored Creating a Learning Culture (Cambridge University Press, 2004), contributed to Changing the World of Work: One Human at a Time (Change Agents Worldwide, 2014) and Leading Organizational Learning (Jossey-Bass, 2004). I also wrote the forewords to Opting In by Ed Brill (IBM Press, 2013) and Engaging Learning by Clark N. Quinn (Jossey-Bass, 2005). In addition, I contribute to Fast Company magazine and have appeared on ABC's World News This Morning and the BBC, as well as being quoted in the Wall Street Journal and Fortune magazine.